The Berenstain Bears have been a staple in children's books since Stan & Jan Berenstain came out with 1962's The Big Honey Hunt. Since then, Stan & Jan (and later, son Mike) have brought a smile to countless parents and children's faces with many more Bear family adventures. Join Papa, Mama, Sister, and Brother in this wonderful series of books that has the rare capacity to both teach and entertain. 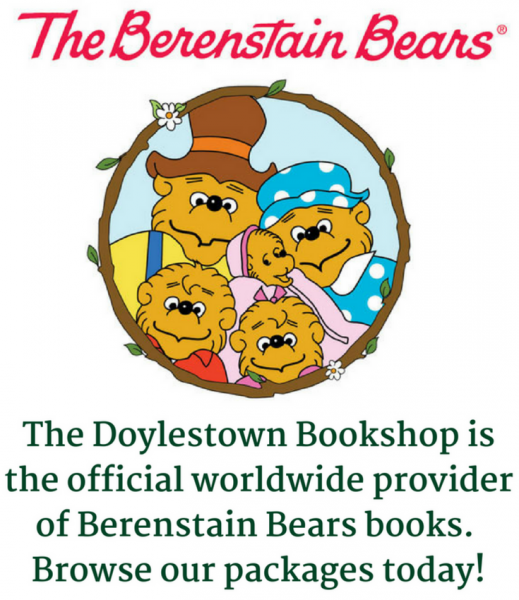 The Doylestown and Lahaska Bookshops have teamed up with the Berenstains to offer 10 unique collections of Berenstain Bear books not available at other bookstores. Each package comes with a 15% discount that is included in the price. No other special sales, discounts or coupons will apply. Standard shipping rates do apply. See Below. •The Free Shipping Option that we employ is Media Mail via the US Postal Service. The standard shipping times for this service during the year is usually 3-10 business days, depending on your location. However, Media Mail shipping times can sometimes be erratic, especially during holiday seasons. If your package needs to arrive before a holiday or is similarily time sensitive, strongly consider using either our FedEX Ground (3-5 business days) or USPS Priority (2-3 business days) shipping options. •For all International orders, you must choose PayPal as your method of payment. If you have any questions, please e-mail the Doylestown Bookshop at mail@doylestownbookshop.com or call (215) 230-7610. Introduce your children to the wonderful world of the Berenstain Bears with this comprehensive 81-book set! Along with the Complete 1st Time Package, the Living Lights are a Christian-themed series of Berenstain titles. The Berenstain Bears have teamed up with Zondervan Publishing in releasing an ongoing series of Christian-themed Berenstain Bears books, now with 13 titles currently available. In this 25 book package the Berenstain Bears run into all sorts of problems like jealousy, lying, confronting a bully and other assorted problems, big and small. You and your children can read how the Bear family tackles these issues together. This package consists of the entire 25 book Family Values Package with the 13 book Living Lights Package. Go to school with the Berenstain Bears with this set of books that explores a whole range of important issues from bullying to the pressures of a big test. A perfect set for those children experiencing school for the first time. Collect this book set of both classic and new hardcover titles including the first ever Berenstain title, The Big Honey Hunt as well as newer titles such as The Berenstain Bears Big Bedtime Book. A great and lasting gift for any child who likes the Berenstain Bears. Introduce even your youngest children to the wonderful world of reading and the Berenstain family with this package of Easy-to-Read stories. Celebrate Christmas, Halloween, Mother's Day and more with the Bear Family in this collection.